OK, granted. It isn't quite as much progress as might be expected, considering that this is for a wee little lad of only two (2) years. 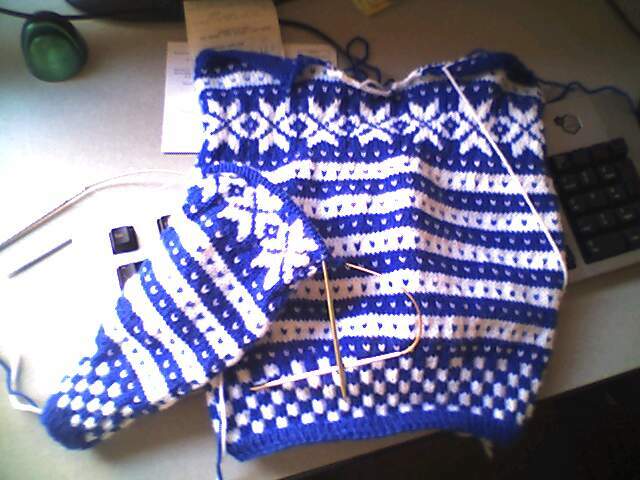 I have gotten the body of the sweater and about 90% of the first sleeve done. I’m rather pleased with myself for thinking to use two circulars instead of five double-pointed needles for the sleeve; it has gone much faster and with fewer wrinkly-bits. I seem to be physically incapable of allowing the yarn to ‘float gently’ across two needles. Call it a character flaw. Item the first: My boss was out of town and I was one of his backups. Automatic five hour penalty to knitting time in the Monday – Friday period. Item the second: My MIL was staying with us all week. Automatic twenty hour penalty to knitting time, for having a houseguest in the first place. Add another four hours per day because she is so stinkin’ fun to talk to, and I a) talk with my hands a lot and b) find myself bent over my knitting laughing so hard I can’t see when she’s around. She’s real hard on my knitting time, let-me-tell-you. And yes. I miss her already. Saturday I was home alone with the kids for most of the day, and Sunday for whatever reason (I’m suspecting someone cast a hex on me) my @*^&@ing arthritis flared up So! Stinking! Bad! that really…about all I could handle was sitting on my patookis watching DVDs or listening to music or surfing the Internet. I took too much Tylenol, gave myself stomach cramps and a case of the jitters, and still found it too painful to knit on The Boy’s sweater. I briefly contemplated starting a new project with bigger needles (these are little size 3 US deals – kind of hard to manage when your hands are sore), but feared that if I did I’d somehow never return to it. It's getting cooler by the day, though, so I'm motivated! I have FOUR MORE sweaters after this one to get through, before the first snowflake falls.